We take a personal approach to resolving family matters with minimal conflict. Law Offices of Shana E. Thompson is a premier divorce law firm based in Seattle, Washington in King County. The attorneys represent clients throughout the family courts in Seattle and Kent in King County and in Everett in Snohomish County. The attorneys at Law Offices of Shana E. Thompson recognize that divorce is a stressful situation for any family. Meeting with an experienced family law attorney is the first step toward understanding the process and how to make sure things go as smoothly as possible. We can help you decide what you need to do right now to protect your rights and get the case ready for its final resolution. During the initial consultation, we help you see the full picture with the goal of resolving the case as efficiently as possible. An experienced attorney can help you carefully plan your strategy for each phase of the case. When reaching a resolution proves to be difficult, an strong and experienced stance during pre-trial hearings and at the trial might be required to bring the case to its final resolution. We come to court prepared to protect our clients and their interests when the parties cannot reach an agreement outside the courtroom. Although many people consider a divorce to be an inherently expensive process, it does not have to be. Many of our clients need help minimizing the conflicts that come up over small things while they focus on the big issues that will matter for years to come. Many of our clients want to avoid prolonged litigation by reaching a favorable settlement to resolve the case on an uncontested basis or during mediation after the case has been filed. Our cases are referred to us by our former clients and other attorneys in the area. We have a reputation for being thoroughly prepared during motions and trials. That preparation in the courtroom helps us earn the respect of judges and attorneys in the community. Our attorneys strive to achieve the highest level of skill, knowledge, and experience. As a premier Seattle Divorce and Family Law Firm, our law firm has a reputation for excellence and a strong record of striving for success in each case. All of the attorneys in the firm are passionate about helping their clients achieve the best outcome for themselves and their family. When you need a divorce or family law attorney in Seattle, Shana Thompson will help you achieve a resolution in your family law matter. She believes in compassion, respect, and using her strong advocacy skills. 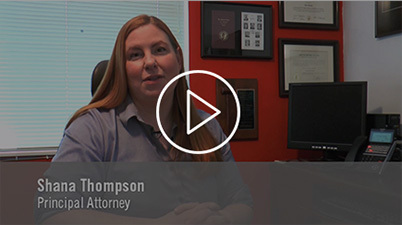 As an experienced and dedicated attorney, Shana Thompson works to protect the rights and interests of our clients at every stage of the case. Whether the case involves divorce, legal separation, alimony, paternity, modification of a prior order, child support or child custody, the attorneys at Law Offices of Shana E. Thompson are here to help. From the initial consultation through the final resolution of the case, the attorneys at Law Offices of Shana E. Thompson can help you find a clear strategy to assert your rights and protect your interests. We have a reputation for resolving a wide range of cases efficiently from a simple uncontested divorce to extremely complex and highly contested case involving the distribution of considerable assets. Our team works tirelessly to help our clients get the best result. Some cases require an aggressive and uncompromising stance to help our clients resolve their case on the best possible terms. The attorneys at Law Offices of Shana E. Thompson are experienced in filing actions under Revised Code of Washington (RCW) Title 26, including dissolutions of marriage, legal separations, and major parenting plan modifications. The attorneys at Law Offices of Shana E. Thompson can help you at all stages of the case including filing a family law action, attending mediation, or attending any family court hearings in front of the judge. The attorneys are experienced in representing clients in divorce and family law cases throughout the Seattle area and the Kent area in King County. We represent clients living in the cities of Seattle, Kent, Mercer Island, Bellevue, Issaquah and North Bend, Vashon Island, and Maury Island. Our attorneys also represent individuals in the surrounding areas including Everett in Snohomish County and Tacoma in Pierce County, WA.